Week 15 brought us the most exciting finish to a game we’ve seen all year, in what could be a preview for the AFC Championship game but if you wanted an indication that we’d reached the business end of the season, this week’s Sunday Standouts serves as that. Seven of our standouts on the offensive side of the ball come from teams in playoff positions, while another come from one of the hottest teams in football right now, the San Francisco 49ers. With that in mind, here are our offensive Sunday Standouts from Week 15. Can a tight end lead a game-winning drive? New England Patriots tight end Rob Gronkowski certainly did on the final touchdown drive of the game yesterday, with several ridiculous catches and the two point conversion. Uncoverable for most of the game, he left Pittsburgh having averaged a ridiculous 4.94 yards per route run, racking up 168 yards from 34 snaps in route. With a subpar showing in Miami on Monday Night Football, people were beginning to write the tales of the end of Tom Brady’s career once again last week. As he has done before though, the Patriots signal caller silenced the doubters with a stunning performance in Pittsburgh. Finding plays downfield, Brady went five-for-seven for 148 yards on throws travelling 20+ yards downfield, the most deep yards by a quarterback this week so far. The Jacksonville Jaguars are headed back to the postseason for the first time since 2007, and we saw a breakout performance from wide receiver Keelan Cole to help get them there. Cole picked up 144 yards on eight targets from 27 snaps in route, giving him a yards per route run average of 5.33 which leads all wide receivers so far this week. Nobody in Pittsburgh will be happy with the way yesterday’s battle with the Patriots ended for the Steelers, but with a potential rematch on the horizon in the playoffs, guard David DeCastro continued his impressive season with another big game. DeCastro finished the game with a run blocking grade of 86.9, which currently leads all guards in the NFL this week. For as much noise as the Patriots are making late in the year, the play of running back Dion Lewis continues to fly under the radar somewhat. That continued yesterday, with the major talking points after the game centering around Gronkowki’s dominance and the touchdown that was taken off the board for the Pittsburgh Steelers. All Lewis did was force three missed tackles on 13 carries, and averaged 3.31 yards after contact per carry, good for an elusive rating of 70.9 on the day. 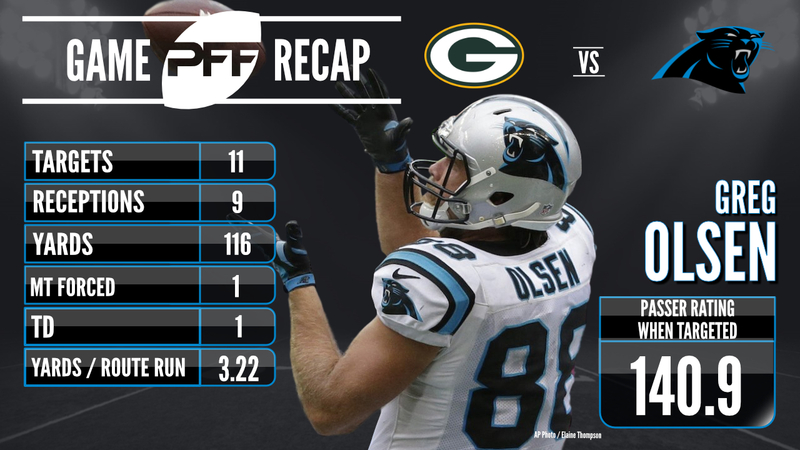 It was a big day for tight ends in the NFL yesterday, and Greg Olsen of the Carolina Panthers was another player who delivered a big time performance to aid his team to victory. Olsen averaged 3.31 yards per route run against the Green Bay Packers, picking up 116 receiving yards from 35 snaps in route. After a rough start to the season, suddenly the San Francisco 49ers are one of the hottest teams in football, and while they won’t be making the playoffs, there is reason to be excited for next year. Wide receiver Marquise Goodwin has blossomed this year, and with 114 yards from 43 snaps in route, he averaged 2.65 yards per route run on the day. The New York Giants didn’t make it easy for the Philadelphia Eagles on Sunday, but the team with the best record in football got the job done, and once again center Jason Kelce was a star. 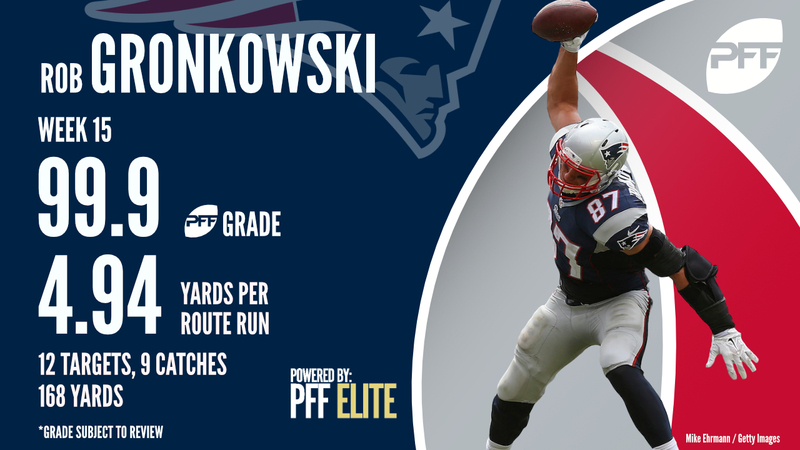 He’s put together the best season of any center in the league so far, and that continued on Sunday with a run blocking grade of 86.7, which is currently the top score by a player at the position this week. The second member of the 49ers to make our Sunday Standouts this week, tight end Garrett Celek made the most of his opportunities in the win over the Tennessee Titans. On the field for just 21 passing snaps, Celek saw just three targets, but racked up 63 receiving yards to give him a 3.00 yards per route run average. They needed a late turnover by the Oakland Raiders, but the Dallas Cowboys are still alive in the playoff race, and quarterback Dak Prescott delivered another big performance to help them on their way. Prescott went 18-for-27 against the Raiders, but with one of those incompletions coming on a drop, and another on a play where he was hit as he threw, he finished the game with a 73.1 adjusted completion percentage.